Which movie should you rent for a quiet night at your hotel or apartment? Definitely "El Secreto de sus Ojos". The movie won the Oscar for Best Foreign Language Film at the 82nd Academy Awards, making Argentina the first country in Latin America to win it twice (having already won for The Official History in 1985). 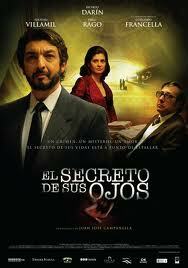 "El Secreto de sus Ojos" (The Secret in their Eyes) is one of the most succesful films in the recent years. The film is based on the novel "La Pregunta de sus Ojos" by Eduardo Sacheri, who wrote the script together with the director Juan José Campanella. Ricardo Darín plays the character of "Benjamín Espósito", an experienced court officer who is recently retired and decides to write a novel. So he finds inspiration in an unfinished case investigated in 1974, regarding the murder of a young woman. Soledad Villlamil and Guillermo Francella complete the cast of this film thats beats every audience records.